• Built or renovated over 28 buildings to LEED standards. • Met the goal of reducing campus energy use per square foot by 25 percent from 2005 levels, a savings of over $25 million in avoided energy costs. • Created the Cliff shuttle system, which runs on biofuel made from recycled hospital and campus cooking oil and transports millions of riders annually. • Diverted 95 percent of construction waste from landfills; also diverts more than 40 percent of non-construction and non-hazardous waste. • WaterHub facility will reduce potable water consumption as much as 40 percent and save millions in water utility costs over a 20-year period. • Created or revised more than 300 courses that engage sustainability issues. • Oxford College Organic Farm provides food to Oxford and Atlanta dining halls, CSA subscribers and a Newton County food pantry. • Created educational garden project, student-run fair trade coffee shop, and weekly Emory Farmers Market. • Developed Emory Healthcare sustainability initiatives; Emory University Hospital Midtown has decreased energy consumption by over 30 percent per square foot since 2009. Building upon a decade of advances in creating an environmentally sustainable campus, Emory's new Sustainability Vision and Strategic Plan is intended to amplify and strengthen the University’s role as an innovative leader in the field. The new vision represents “a step forward in our long journey toward a sustainable campus and community, offering aggressive goals that move us far beyond where we’ve been and making sustainability an even deeper part of who we are as an institution,” says Ciannat Howett, director of Emory’s Office of Sustainability Initiatives. The plan builds upon foundational work launched over a decade ago to adopt sustainability as a guiding principle and inscribe it into Emory’s 2005-2015 Strategic Plan, says Peggy Barlett, Goodrich C. White Professor of Anthropology, who co-chaired the Sustainability Visioning Committee. Since then, the University has garnered national acclaim for its pioneering innovations in green building, curriculum development, sustainable food procurement, and award-winning energy and water conservation efforts. Support culture change among academics, health care and operational units to carry forward courageous action on sustainability. Expand the network of sustainability champions to strengthen leadership at every level. 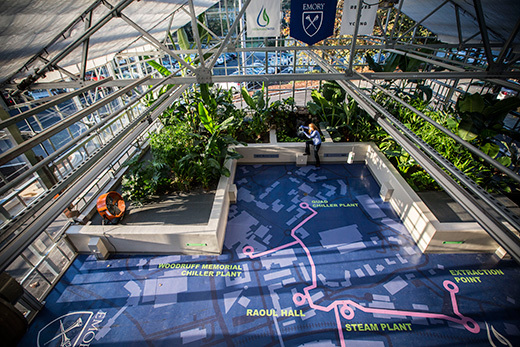 Use Emory landscape, buildings and operations to model sustainable choices. Create strategic partnerships with local, national and international institutions to build flourishing and resilient communities. Along with each action area, the plan also poses guiding questions, which are intended to stimulate creative thinking towards sustainability efforts among all Emory units, Barlett explains. Those questions cover issues such as how to assess sustainability contributions, build expertise and share knowledge, stimulate new initiatives, and strengthen support for cultural change. The plan also poses specific recommendations for achieving its goals. Ideas include strengthening faculty leadership through a rotating Faculty Fellows program, increasing the number of sustainability-related courses taught across campus by 25 percent by 2025, and creating a data hub and interdisciplinary laboratory to support campus-based sustainability research activities. Reduce University campus energy use per square foot by 50 percent and total energy use by 25 percent (calculated with 2015 data baseline). Reduce Emory Healthcare energy use by 25 percent. Self-generate 10 percent of energy used on campus to replace fossil fuel sources. By using reconditioned water through the WaterHub, eliminate drinking-quality water for heating, cooling, toilet-flushing and other non-potable uses, with a goal to reduce Emory water use by 50 percent. “One of the things that has always impressed me about Emory is that people here are not afraid of new ideas or trying something innovative even it it’s going to be hard, because we see the benefit,” says Matthew Early, vice president for Campus Services and a committee co-chair. “I like that fact that these goals are difficult,” Early says. “It’s not an easy plan, and that excites me because I like a challenge. We can’t just rest on our laurels. With this plan, we’re pushing ourselves even further." Work on the plan began in fall 2014, when Emory President-elect and Provost Claire Sterk and Executive Vice President Mike Mandl appointed a visioning committee to launch the process. Their task was shaped through leadership meetings and campus-wide community conversations that yielded more than 200 suggestions, most of which were integrated into the final report. Over the past decade, Barlett says she’s noted a profound cultural shift in public awareness and investment in sustainability efforts. Although the new plan is intended to guide Emory for the next 10 years, a midcourse review will be conducted after five years to ensure that the vision is still relevant and on target, Howett says. For more information about sustainability initiatives at Emory or how to get involved with campus efforts, visit the Office of Sustainability Initiatives.